The SRT Tomahawk Vision Gran Turismo is headed to Gran Turismo 6 on the PlayStation 3 and this new virtual supercar comes with a massive 2,590 horsepower. FCA (Fiat Chrysler Automobiles) US LLC announced the "SRT Tomahawk Vision Gran Turismo" in Detroit, USA. The car comes in 3 variations in tuning levels, and will appear in a free update of the PlayStation®3 exclusive title "Gran Turismo 6" in the summer of 2015. SRT (Street and Racing Technology) is the performance division of FCA US. And their machine themed "the sportscar of 2035", is the "SRT Tomahawk Vision Gran Turismo". 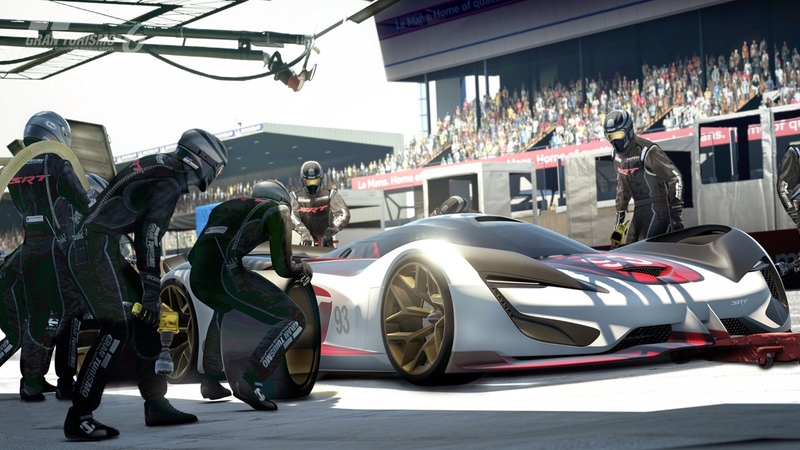 The design and SRT engineering departments came together for the SRT Tomahawk, in order to develop the best possible driving experience for Gran Turismo users. The car is packed with ideas and technology that goes a step or two beyond modern day racing cars. The exterior shaped with voluptuous curves has a narrow waistline and has a structural spine that extends behind the cockpit. In addition to the aggressive front facia, the rear of the car that is viewed the most during game play utilizes sleek plasma lighting and 5 impressive exhaust pipes. The clear cockpit and engine covers are made of graphene lattice, a form of carbon. The instrument and communication information fed to the driver are all displayed in an overlay on this graphene surface. The main power source of the Tomahawk is a 7 liter V10 engine with a 144 degree bank angle. The front tires are connected to a pneumatic power unit that stores compressed air to produce drive force. This pneumatic power unit not only drives the front wheels, it also operates the air suspension system for all 4 wheels and powers the pressurization of the G suit worn by the driver. In addition it is also utilized to activate the aero panels placed all over the body. The Tomahawk has built in aero panels above the 4 fenders, at the rear end of the body sides, and at the rear, which are activated by pneumatic power as necessary to produce downforce and even perform yaw control of the car in corners. A revolutionary active camber system adjusts the wheel knuckles to “lean” the vehicle into turns, with each wheel angling outboard or inboard to maintain the optimum tire contact patch and highest possible mechanical grip. There are 3 grade models to the Tomahawk, separated according to the level of engine tuning and device controls. Players can choose the Tomahawk most suited to them according to their own skill and racing level. The Tomahawk S is the entry level machine to prep players for the incredible performance of the Tomahawk series; but the specs of the "S" are already off the charts. The 7.0-liter wide-angle V-10 is tuned to deliver 792 hp (compared with 645 hp for the 8.4-liter V-10 in the 2015 Dodge Viper). The pneumatically driven front wheels add 215 hp, for total system output of 1,007 hp. With a curb weight of 2,026 pounds, this version of the SRT Tomahawk is the heaviest, yet it has a top speed in excess of 250 mph. Race tuning pushes output of the V-10 to 1,137 hp, while the air-driven front wheels add 313 hp for total system output of 1,450 hp. Aggressive weight-cutting techniques whittles the curb weight of the Tomahawk GTS-R to 1,459 pounds (the lightest of any version) and the top speed in excess of 300 mph. This is the ultimate Tomahawk that incorporates a variety of experimental technologies. With a redline set at 14,500 rpm, the V-10 engine pumps out 2,168 hp (nearly three times the output from the base Tomahawk S) The front wheel drivetrain contributes an additional 422 hp at peak, for total output of 2,590 hp. That gives the Tomahawk X a top speed of 404 mph. Due to the extreme performance of the X version, the driver is required to wear a G-suit to withstand the extreme cornering forces. Manager – Advanced Concepts, SRT Engineering, FCA US LLC.